Box style Forging Box type pistons also have their pin bosses moved inward toward the center of the piston, but include an additional rib to strengthen the deck of the piston and pin bosses. These too allow the use of shorter wristpins which promotes reduced wrist pin deflection. The box structure actually creates a “box” around the small end of the connecting rod. 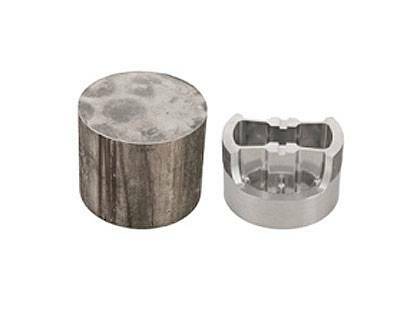 These pistons are not always lighter, but are typically stronger than traditional round style pistons and typical X- Forgings. Round Forgings The most common type of forgings and have the side relief machined into the piston versus having it forged like the forgings below. Since machining the side relief takes place, it allows flexibility for different styles depending on the application and final weight of the design. The bottom band can be left on for use of buttons, or it can be machined off to remove weight or help large stroke engines that come out of the cylinder at BDC. X-Forgings X-Forgings are designed to minimize friction and reduce weight without compromising strength. They have the side of the piston forged and their pin bosses moved inward toward the center, allowing the use of a shorter wristpin. 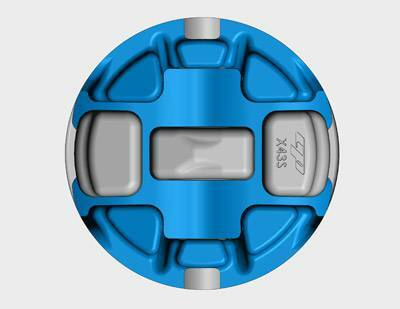 With the use of different strut angles and bracing, an X-Forging is configured by adjusting the weight balance between high and low stress areas. Billet A billet is made from a bare aluminum cylinder (extruded bar stock) and is the same material as the forgings. This approach gives us the ability to create any geometry desired and is often used when a forging is not available for a given application, or they can be chosen for prototyping before a new forging design is released. Although we have many forgings, sometimes preference is still a billet, as it is a free-form process ensuring a perfectly matched result every time. We offer several different finishes on our billets and the price is determined accordingly. Depending on what tools can be used, how many edge breaks/rounded corners are preferred and tool step over on the program – all determine spindle time. 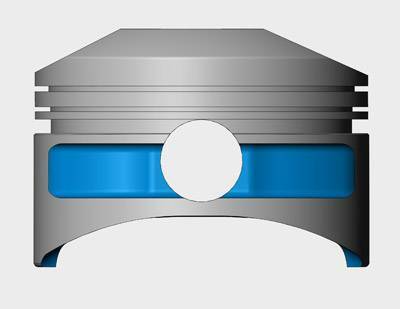 We are also able to place the center of gravity in “X” and “Y” at the center point of the piston when feasible and create a balanced piston for tighter piston to cylinder head clearances. 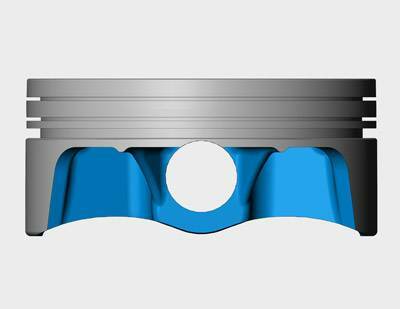 Shot peening is always an option on a billet and when done, it makes the fully machined underside appear very similar to a piston on a forging.